It was the only red pickup on the lot. Raul Lopez Hernandez stood in bright Salinas afternoon sun, looking at the truck like it might disappear before his eyes. Sweat-stained hat in hand, he wiped beads of perspiration from dark forehead with the back of his sleeve. No salesman came out to greet him. Other than a truck parked over the concrete service trench—a mechanic working below—not another soul was in sight. Somewhere inside the clapboard shack, a phone rang, a hollow noisy sound. A counter by nature, Raul listened to it ring ten times before the caller gave up. Maybe the salesman is at lunch, Raul thought, glancing across the street at the clock over the door of the hardware store. A few cars passed, but for the most part, it was a quiet typical Salinas Sunday afternoon. A large sign over the shack announced, OPEN FOR BUSINESS! Maybe they mean most of the time. Hand deep in his pocket, he touched the roll of bills, warm from body heat, nestled like rolled tortillas in a bag, waiting for salsa and lime. He'd eaten three tortillas, two tamales, two helpings of rice and frijoles and a bottle of Coke© . Stomach full and feeling better, he walked to town, turning now and then to enjoy the sight of the Santa Lucia mountains to the west, hillsides glowing golden in afternoon light. His wife, Delores Pilar Hernandez remained home with their three young children. "Do we really need a truck?" She was spooning out re-fried pinto beans onto the white stoneware plate, the one with the crack, one of six she'd found at the weekend flea market, ten cents each. Outside, he heard the sounds of their children playing. "Can you get better work?" He chewed for at least a minute, and swallowed the mouthful before answering. "Yes. I could get more work here as well as in Monterey. Watsonville is growing fast. With a good truck, I could take produce up to the bay area. I could get better money up there." The answer seemed too long, and he hoped he hadn't sounded like someone searching for reasons. He took a long drink directly from the soda bottle. "Can we afford to spend that much money?" Towel in hand, she wiped up nothing from the red and white oilcloth, a gesture he had come to understand over the years to mean she wasn't ready to stop questioning. "We can't afford not to." Enjoying what he considered the best cooking on earth, he took a large bite of tamale and hoped she'd change the topic. "It's all our savings." She wiped her hands on the front of her apron, another one of those gestures he understood too well. He kept chewing and waited. This would be her final shot. "The children need new clothing. They need new shoes when school starts. You need new work-boots too." He knew she was concerned, rightfully so, the depression on everyone's mind. He wiped his mouth on the back of his hand. "If we don't get a truck, I'll have to keep working in the fields. You know how long I've been working, Delores. I'm getting older each year…and this place…maybe we can find a little place by ourselves…maybe a place for a garden… ." He knew how much Delores wanted her own garden. Sighing, a sound he wished he hadn't heard, Delores turned and went to the sink. He watched her looking out the small window toward the row of shacks where the other braceros lived. She's the most beautiful woman I've even seen, Raul thought, remembering how he'd courted and won her love, a gift he cherished above anything else. Twelve years of hard work have carved lines at the corners of that sugar-sweet mouth, but when she smiles at me, mi Dios…I can never find it in my heart to say "no". Her back to him now, she washed her hands in the old enameled bowl. "You know best, Raul," she said, voice flat as the top of her stove. Now, hand in pocket, he could still hear her words. These words jarred him from reflection. An innocent remark, Raul seldom took offense at Gringo's greetings. Maybe they don't know better, he thought. The car-salesman must have come up quietly behind him or else he'd been standing too long in the sun. "What can I do for ya, Pancho? Ya lost?" Raul looked at the speaker. Typically speaking louder, as if volume might help, the salesman tried again. Nodding slowly, Raul smiled, white teeth his best feature, pearls in a bronze setting. "Yes sir, I speak English. I'm not lost. I was looking at the trucks." "Swell trucks, aren't they, Pancho? Love ta have one myself. Best trucks made these days." "How much is the red one?" Raul asked, running calloused fingers through his thick black hair. The car salesman looked at him for a few moments before answering, thoughts as clear as headlines on the front page of the Chronicle . "Well now, Pancho…how much ya got?" Raul turned this time to look directly at the salesman, eye to eye, no expression in his to give away his position. "Well now…are ya really serious, Pancho, or are ya just passin' the time-a-day? I've got some important things ta take care of, but if yer serious…come on in and sit. Maybe we can work somethin' out." "No," Raul said, deep-black eyes measuring the skinny man in the stained dark-stripped suit, collar open, gaudy tie hanging just off center, ketchup spots on the off-white shirt, "I think we can talk here." A quick grin like a twitch at the corner of his mouth, the salesman snapped his suspenders with both thumbs, straightened his tie and shrugged. "Okay, Pancho, make me an offer." "Five hundred dollars," Raul said, no change of expression, "tax and license." "You gotta be nuts!" The salesman laughed and slapped his thigh. "These babies go for six hundred eighty!" "When did you make your last sale?" Raul tilted his head toward the silent row of vehicles. "These trucks have been sitting here for the past four months." "You live around here?" The salesman's eyes narrowed and he shrugged again uncomfortably like something was crawling up his back. "How come ya know so much about truck-sales, Pancho? You an expert in truck-sales?" Raul turned and began walking away. I can always take a bus up to San Jose or Oakland, he thought, returning sombrero to head. No use dealing with this Gringo. Someone will sell me a truck without trying to cheat me. "Hey, now…wait up. Don't go walkin' away without doing a little bargainin', Mex. You really serious about that truck? You really got five hundred dollars?" Without turning around, Raul stopped and looked at the truck again. It is a nice looking truck. Everyone says they are the best; and red…no one would miss seeing me in a red truck; my name on the side, Hernandez Family Produce. Maybe I could make enough in a few years to buy two. "I want a bill of sale. Make it out to Raul Lopez Hernandez, tax and license included. And a full tank of gas." Five minutes later the salesman was shaking his head as he handed Raul the receipt. "Jesus Christ, I'll be damned," he said, cash in hand, holding the money like a ticket to heaven. "I'll be damned! A Mex with five hundred bucks cash! I'll be God-damned." "How do you shift it?" Raul was looking through the open window at the stick coming up out of the floor. "Jesus, haven't ya ever driven a car?" The salesman directed his next remark at the mechanic who'd just filled the tank. "Hey, Henry…come back here an' show the Mex how the truck works. Take him around the block a few times an' show him how ta drive." "Hernandez… ." Raul said, politely, turning this time to face the man, smiling at the skinny salesman from under the brim of his old straw hat. "Yeah…Hernandez," the salesman said, and grinned, still fondling the currency. "Take Mr. Hernandez for a spin." Fifteen minutes later, Raul traded places with the mechanic, shifted into first and stalled the motor. Raul Lopez Hernandez wasn't a nervous man. There were no cars in sight in either direction. The next two tries got the truck moving…hopping…then rolling, and ten minutes later he was back at the bracero camp, one hundred twenty dollars still tightly rolled, deep in the pocket of his best pants. "This is the second time in two weeks that truck's been in the shop." One hand full of invoices, Raul was grumbling, frustration not lost on his youngest son. Miguel Lopez Hernandez was standing in front of his father like a private in front of a general. "You're good with machines, Miguel. How can we pay these bills if that truck spends all its time up on blocks?" "Golly, dad…it's got over a hundred thousands miles on it. Maybe it's time to rebuild the engine." "And where are we going to get the parts?" Raul knew he was more tired than upset, almost sorry he'd sounded so exasperated. "You have some pull with the government, son? You've stripped two wrecks already. What did you do with the engine from the black truck?" "Mr. Gutierrez has it in his shop, dad. Remember? We gave him that truck for his labor, but he still owes us another fifty gallons of gas. Pablo filled-up before leaving this morning. He's got enough gas for two runs, but that's the last of the coupons for the week." Rubbing calloused hands together to get them warm, he looked out the office window at the yard. Carlos and Ramon Santos, his other two drivers, were washing the big '40 flatbed truck, checking it as they always did to make sure it was in good running condition. He glanced at his watch. Eleven. They're like clocks. They already made the trip to Oakland and back. Because they didn't speak English good enough for Uncle Sam, they'd been passed-up when they'd tried to enlist. Built like a prizefighter, Carlos wasn't very bright, but was a very careful driver. Brother Ramon is just as good behind the wheel. Both are honest and that means a lot to me. Neither of those boys have cost me an unearned dollar…and they're hard-working and tough as leather. Raul remembered how Carlos had put a Teamster roughneck in a body-cast after the bully tried pushing him around at the produce market at Jack London Square. "I wish they'd leave us alone," he continued, speaking to the window. "We're not big enough fish to cause them any problems. We're like a family, those Santos boys…you and your brother…why do they have to try to cause so much trouble for us?" It wasn't a question looking for an answer, so Miguel only shrugged. "Pablo'll be back soon, dad. We'll get the red truck back tomorrow. You'll see. Everything's going to be okay. Don't worry so much, dad. Business has been good this month." "Your mother says the same thing." Raul's voice changed tone when her face came to mind, and he looked at his son affectionately. My little muchacho…seventeen now and a mustache already growing under his nose. He smiled at Miguel. "If it wasn't for you boys, I don't think we could have come this far. You're quite a young man, Miguel. You're lucky you were too young to go to war." Usually good at hiding feelings, Miguel would have blushed had anyone overheard the remark. He looked down at his feet, trying to mask emotions, wishing he were older and able to wear a uniform like his brother, Pablo. "Maybe next year, dad. I'll be eighteen in August… ." The sound of the truck coming into the yard turned both heads. "See," he said, already running for the door, "it's Pablo. He's okay!" Eager to give him a hand with the clean-up, Miguel's admiration for his older brother was transparent. Raul watched Pablo climb out of the cab after turning off the motor, a move that took the young man some effort. His left leg is still not as strong as his right. Raul would never forget how a mortar shell on Guadalcanal in '42 had sent his son home with a Purple Heart. On the dresser in his mother's room, it and a Silver Star with two clusters next to Pablo's picture was seldom discussed. Raul stood on the porch and watched his boys, proud of both. They worry me at times, but I'm still glad I've done what I've done. So is Delores. He pictured her in her garden, her smiles as she watched the boys growing up. He remembered her expression whenever she read the news about the war…and the shock when she'd received the telegram from the War Office. He thought about Pablo's return and recovery under his mother's loving care. It left him with feelings he couldn't discuss. In many ways Miguel and I are much more alike, like his mother says…solitary and stubborn. She and Pablo…now there's a pair…social, outspoken, outgoing. Those were traits he admired, but didn't attempt. When his oldest son came into the office, Raul was working on the books. "Here's the sales book, pop…and the bank receipt. I made a deposit before coming in. We had another good day. Chong and Associates bought everything I had. It was a one-stop trip, except for the bank. I didn't think it was a good idea driving around with all that money in my pocket." His father nodded as he went through the book. He logged sales into the register in ink, then handed the sales book back to his oldest son. "No problems with the union?" he asked, hand unconsciously coming up to left eye, rubbing the painful memory of the confrontation with the Teamsters earlier in the year, wishing he'd ducked sooner. "No sir." Pablo shuffled his foot and grinned. "After what Carlos did to that one guy…well, maybe they'll leave us alone." "They know you're a hero!" Miguel beamed, close behind him. "They don't want to mess around with someone like you!" Other than a fleeting glance, Pablo didn't acknowledge his younger brother's remark. "The tires still look pretty good, sir. They're better than the last set. Mr. Gutierrez told me he knew someone with another new set. I'll talk with him tomorrow." Just hearing the name Gutierrez brought a smile to Raul's face. What a small world. He remembered their introduction. Gutierrez had sold the small cottage to them only three years before. What a blessing, he reflected, crossing himself. A real home and a garden for Delores. How times change, he sighed. Looking back out into the truck yard, he considered those changes. Two grown sons, a daughter still in high school, three trucks, the business, our friends, the hard times and the good. I wonder when it will be over, he thought, wishing the war would end, dreading the thought that Miguel might enlist. "It makes people do crazy things," he said out loud. The out-of-context remark made the boys look at each other, wondering what was going through his mind. At times their father's attention would shift so far from current conversation that people thought he was somewhat loco. "The Gringos don't trust anyone who isn't white. It's a shame." He crossed himself again. "I'm glad I'm not an American Jap. They put them in camps somewhere back in the desert…just because they're of Japanese descent. Those people are Americans…just like you kids, but they were born yellow. I'm glad we were born brown or they would have shipped us off too." "But dad," Pablo interjected, "some of them could be traitors or spies." "Then they should be charged with that crime!" Raul came to his feet, looking up into the eyes of both sons. "No one should be accused of something and not given the chance to defend himself. You know how hard we've had to work just to get where we are. There are people out there who don't like anyone who's a different color. You know what it feels like to be called names. In this country, a man is innocent until proven guilty! Remember that, both of you!" He crossed himself. "Gracias a Dios. Thank God." He took his coat from the wall-peg, "Thank God for small favors. Let's lock up and go home for dinner. Let's not keep your mother and sister waiting." Miguel drove the '39 pick-up while his father and brother discussed the week's business. Miguel's mind was on the war in the Pacific. It's not fair, he thought, images of fighter planes hot on Zero's tails, imagining himself in a cockpit, sights on a smoking Jap plane, finger squeezing the trigger, the rattle of machine guns in his ears. They need me. He had to swerve quickly to miss a gray Chevy sedan that didn't stop at the intersection. "Get us home in one piece," his father said, guessing where his son's mind had wandered. "Don't be in such a hurry to die." Teresa was on the running board before Miguel could stop the truck. "Daddy!" she shouted over the noise of the engine, her face flushed with excitement. "Guess what? My counselor says I'll qualify for a scholarship if my grades don't drop. I may get a scholarship to the University of California. I'm going to go to college!" Unaccustomed to accepting declarations he hadn't been party to, Raul nodded anyway, arm around his youngest, wondering why Miguel hadn't tried harder in school. "That's nice, Teresa…that's nice. But let's talk about this after dinner." "But, daddy," Teresa said, giving him a hug, "I've studied so hard. I know I can do it. I'll make you so proud of me. I want to be a doctor." Still nodding, her father patted her affectionately, wondering what Delores thought about their daughter's goals. Things are changing too fast, he mused, watching her going up the steps in front of him. She looks just like her mother, he thought, then shocked by the sudden realization that his little girl was growing up too, with curves just like her mother's. "We'll see, Querida, let's talk later." Waiting at the door, Delores overheard the conversation. Her smile made any other questioning fade. Arm around her daughter, Delores danced through the small front room, twirling to the sounds of Benny Goodman's big band. "What do you think of our daughter, Raul? We'll have our own doctor to care for us in our old age." Laughing and whispering conspiratorially, the two females finished making supper while Raul sat with his sons on the front porch, frustrated by images of Teresa at school with all those young men. "Maybe they're all in the service," he said, unsettled by the thoughts he was having, looking out over Salinas. Glancing at each other, Miguel and Pablo only smiled. "Put your coat on, dad…it's getting cooler," said Pablo, leaning back on his elbows. "It's going to seem more like Christmas this year with all that snow in the mountains." "I'm just glad we're all together now." His father slipped his arm into the thick, familiar plaid sleeve. "Family is everything. And don't you two forget it!" The three sat for another fifteen minutes in silence, enjoying the peace, the crystal-clear early evening air, stars already appearing in the apple-green night sky. Bing Crosby crooning White Christmas had replaced Benny Goodman when the three went back into the warmth of their little home. "She's coming home for Christmas, isn't she?" Raul was drying dinner dishes as Delores handed them to him at their kitchen sink. "Of course she's coming home." Delores pulled the rubber drain-plug. "She wouldn't miss Christmas with the family. She called Claudia and Pablo last week to tell them she'd been accepted at Stanford Medical School. When they read her Master's thesis and faculty letters from Berkeley, they gave her an interview. Teresa is so proud, Raul. Did you know that only two out of every three thousand Latinas even graduate from college? She's going to medical school, Raul. Our daughter is one in a million. I'm so proud of her." "Si," he grinned, though his mind had been on other things, like work and his oldest son's growing family. "I am too. I'm proud of all our children. Did Pablo tell you they were expecting again? I guess Claudia has figured out he's a very fertile young man. That Jap bomb didn't slow him down." Sometimes I wonder if he even listens when I speak, she thought, but the frown on her brow didn't diminish her husband's pride in his sons. Look at him…he's proud of Teresa too, but like most men, he's glad he fathered boys. Sons work with fathers. They spent more time together than he does with me. I shouldn't worry…business is going well. Pablo's taken over most of the buying responsibilities, and from what he says, Miguel has managed to maintain our trucks. Raul seems to like Jamie Morales. It's been a blessing to have a sales manager. Miguel says Jamie has nearly doubled business in a year And those Santos brothers…they keep everything else running smoothly, hiring drivers and keeping union-goons away from the yard. It was almost like Raul had been reading her mind. "The union is serious about wanting us to join." He shrugged and hung the dishtowel over the hook by the kitchen door. "I can't keep fighting those guys all the time. I guess I'll put it to the vote. If the drivers want to join, I guess I shouldn't stand in their way. Maybe there are benefits…but if those guys just saved their money instead of spending it like there was no tomorrow, they would be able to retire some day on their own." He stopped for a moment and crossed himself. "They'd have money in the bank to cover hospital bills…they'd have anything that union offers." "Did Pablo tell you how much it cost when Claudia had Maria Louise?” Delores asked. “Their hospital bill was over a thousand dollars and she was only in there four days. Everything costs so much these days, Raul. Things are changing." When the phone rang, Delores answered. Guessing it was Claudia, and that the two would talk for a while, Raul slipped his jacket on and went out on the front porch. A thousand dollars, he thought, looking at the twenty year old red pickup truck parked in the driveway, remembering what that five hundred dollars had meant to him. Though the sun had set, the sky up toward the bay area was glowing as brightly as it had an hour earlier. Things are changing, he mused, sitting on the front steps, listening to the sounds of crickets and birds roosting for the night. I remember the sounds of children playing. That's a sound I've missed as ours grew older, one I enjoy when Pablo and Claudia bring Ernesto and Maria Louise over for dinner. Now I'm going to be a grandfather for the third time. I hope it's a boy. He smiled, crossed himself, then stuffed his hands in plaid jacket pockets. I wonder when Miguel is going to get married. Twenty seven. This is his third girlfriend. Those first two were flirts. I'm glad he didn't make a mistake. For a Gringo, this one seems like a sensible young woman…and she's very pretty. Sniffing the air like a stud horse, he caught the scent of Delores's apple postres followed by freshly-roasted coffee. What a way to call a man, he thought, chuckling, standing, looking out over Salinas across the valley, noticing the heavy thickening haze, night travelers, occasional headlights like distant yellow lanterns on highway 101, but pleased by family events over the last few years. Turning to go in, he ran directly into the roof-support post, the impact nearly knocking him down. More surprised than hurt, he felt slightly disoriented, chagrined to have walked into a post on his own front porch, a post as familiar as the porch itself. Why didn't I see it? Closing his right eye, he turned and looked out over the valley. The familiar lights of Salinas were faded blurs. Had they not been as familiar as his front teeth, he wouldn't have been able to describe what he was seeing. Testing his right eye, holding his hand over the left, things appeared normal, although the air seemed much thicker. Too many cars, he thought. Still a bit dizzy, he went back in, sat at the kitchen table, but said nothing to Delores about the incident. Apple postre, his favorite tort, left him feeling stuffed as one of those delicious morsels. Over the years Pablo had grown used to drinking coffee all day and could slip into deep sleep even after two rich cups before bedtime. Tonight he lay beside Delores, listening to the sounds of her steady breathing, heart filled with happiness for her and their children, but disturbed by the event on the front porch. Later, he drifted into an uncomfortable dream, like a stick snarled in a torrent, floating on a night-highway with only one headlight, blurred images of passing truck drivers trying to waive him off the road. As usual, Raul found breakfast waiting. Delores always managed a meal no matter how early he rose. Eating Huevos Rancheros in silence, he wondered if perhaps he shouldn't chat a little just to keep her from guessing he was worried. "It's getting colder." He cleared his throat and wiped his mouth with a napkin. Delores looked at him and nodded. "It hasn't snowed yet in the mountains," he added, scooping up huevos and frijoles with a rolled tortilla. Though headed for the stove, Delores turned and gave him a long look, one that made him wish he'd given his conversation a little more thought. "Are you feeling well?" Large dark eyes were searching his familiar face. "Sure…sure!" He grinned like a boy and took a swig of hot black coffee. "I'm in great shape for a man my age. It's your cooking, Delores…you keep me healthy. Better than any doctor." "Go to work, Raul." She smiled and shook her head. "Your compliments aren't going to get a second helping of anything. You have to watch you weight." "How can I watch my weight when you fix such wonderful food!" He gave her a toothy grin and took his plate to the sink. "But you're right, Querida, I won't get old and fat or you may run off with some younger man. I have to take care of myself to keep up with someone as young and beautiful as you!" "Raul," she snapped, giggling like a schoolgirl, "now don't waste the whole morning teasing me with that kind of nonsense. If you don't go to work, no one will know what to do. Come home early and I'll make your favorite supper." Arms around her waist from behind, Raul kissed Delores on the nap of her neck. "I love you, Delores. Never forget. Siempre. I've always loved you. There's never been another." "Oh, Raul, you old romantic… ." she sighed, "go on, now, or you'll never get home." The truck started on the first try and Raul wheeled out of the long circular drive like a kid in a toy. Shifting into second while turning onto the asphalt road, he left a little patch of rubber and flying gravel. "Adios mi chaparita... ." he sang, shifting into high, tapping left foot to the familiar melody in his head as he headed for Salinas. "I may be getting older, but I still have a lot of miles in this engine." He laughed at his implication, and rubbing his growing belly, recognized the familiar nagging sensation. "There's still a lot of gas in my tank!" Loosening his belt, he raised one hip and rolled down the window. The fart could have been heard by anyone standing along the edge of the road. "Ay ay ayyyyyyy!" he laughed, crossing himself, laughing so hard that tears came to his eyes. "¡Dios protege nuestra familia! " Raul folded the Chronicle and dropped it on the kitchen table. "Did you see that picture?" Delores, back to him, was working at the sink. "Those kids look like girls. And what does that name mean? Who in their right mind would want to call themselves insects…Beatles?" Drying her hands on a cotton towel, Delores just smiled. "It's only entertainment, dear. Everyone wants to be different these days." Dismayed, shaking his head, Raul stood, finished the last sip of coffee and took his cup to the sink. "What's this world coming too, Delores? The world still fighting…kids telling grown-ups how to act…boys looking like girls…free love." He crossed himself. "God knows that's the only thing that's free these days…beside all those freeways they're building. Dios protect us, have you noticed the smog? The sky's no longer blue." Delores gave him a peck on the cheek and headed for the living room. Raul was a few steps behind. "Miguel is coming over to pick you up. You were planning on going in to the office?" It really wasn't a question. She put a warm sweater on over her favorite green dress, a Christmas present from Raul three years earlier, then looked at herself in the hall mirror. "He called while you were in the bathroom. The problem with the truck is a broken axle." "Which one?" Raul was looking around the living room for his old coat. "Where did I put my jacket?" "The red one, silly," Delores said lovingly, handing him his battered plaid jacket. "Here…it was right where you left it…next to you on the chair." Clearing his throat, he avoided his wife's gaze. "If it was a snake, it could have bit me." He laughed and picked up the coat. "Some days, I can't find anything." Arms around her, he gave Delores a tender kiss. "If it wasn't for Dios and you, I would have been nothing." He smiled fondly and crossed himself. "Every man needs a woman like you…but I got her!" He laughed and pinched her well-rounded bum. "Go to work!" she scolded, playfully. "Get your truck fixed so we can go to church tomorrow. I'm not going to walk all the way there and back when it's so cold!" "Don't worry, Querida. You will arrive in style. 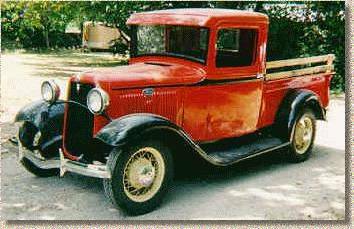 No one but us has an antique red truck." Raul shut the front door behind him and waited on the porch for his son, disturbed by the ever increasing fact that his sight was getting worse daily. Cold weather clearing the air, his breath made little clouds of steam each time he exhaled. Though he'd never smoked tobacco, he brought fingers to lips, inhaled deeply and exhaled a cloud of steam. Chuckling, he felt silly for playing such childish games. Even though it was a mile away, Raul heard the familiar sound of his son's sport car, the resonant purr, engine revving as the young man went through the gears on the curving road leading up the long hill to the small house. Skidding to a stop, four wheels locked, Miguel was waiving wildly. "Hop in, dad! Hurry up! Sandy just called and said our neighbor is driving her to the hospital! Her water broke! She's going into labor! We gotta get to the hospital right now! I'm gonna be a father!" "Let me tell your mother!" Raul said, so excited he was having a hard time breathing. "She'll want to go too!" The image of the three in the little European car turned heads as it squealed around corners, finally breaking to a halt in front of the hospital emergency entrance. Not pausing to open his door, Miguel vaulted from the car and was through the swinging doors before Raul could open his door and get out. "You remember the way… ." was all they heard as their son disappeared from sight in a swirling sea of medical greens. "Take my hand." Raul offered his to Delores. "This thing is hard to get out of. I don't know why he couldn't buy a Chevy or a Ford…an American car. What's a man doing with a sport car and a growing family?" "Now, Raul," Delores said, "he's just like you. A red car is just his way of feeling important. Let's go in before Sandy and the baby are ready to go home." There was another pair of grandparents in the waiting room. Delores and Raul sat on the same bench where they'd waited when Claudia had been in labor. Ernesto, Maria Louise and then Victor, two years or less separating each birth…three more smiling, happy, laughing children bearing the Hernandez family name. All healthy, thank God, thought Delores, looking through her purse for a tissue, nose running from the cold open-air ride. "Where's Miguel?" Raul asked, scratching his stomach. "Do Pablo and Claudia know?" Delores blew her nose, and excused herself to the others present. "Miguel didn't say. Should I call the office and see if Pablo is there?" "I'll go call," her husband said, standing stiffly. "These benches are getting harder every time we come here." Delores watched Raul walk to the payphone, insert a dime and dial the office. She couldn't hear, but by the expression on her husband's face, she knew he was talking to their son. It's a shame her parents couldn't have lived to see this day, Delores thought, recalling the accident that killed Sandy's. What a shame. Victims of a drunk uninsured driver. Sandy must be missing them madly. She thought about the fair-skinned, blue-eyed spirited blonde, how she'd made herself instantly at home in the otherwise totally Mexican-American household. She's always the last to sit after kitchen work is done…she's a hard-working, sweet-tempered young woman. Delores was just as pleased as her husband when Miguel married and settled down seven years earlier. Wearing a green smock, Miguel came through the waiting room doors. White cotton booties and hairnet made him look like a hospital employee. "She's in the labor room." He sighed and perched like a nervous bird on the edge of the bench next to his mother. "Golly, this isn't easy for women, is it?" Delores took his hand in hers, and waited until he turned his face, deep-set dark eyes moist and humble. They reminded her of her husband's when Miguel was being born. "She can do it." She smiled affectionately. "Women have been having babies for ever. It's hard work, but when it's over, just look what we have. All I can tell you is I'm glad I had you children. I wouldn't change a thing. You've been the candle in my window when things were difficult. Sandy is going to be fine. You'll see. You're going to be very happy, Miguel. There is nothing like a family. Nothing." Raul hung up the phone, came back and sat down. "He's going home to get Claudia. The children are still in school until Friday." Turning his attention to Miguel, he searched his face. "So, doctor…what's it going to be? A boy?" Smiling almost wanly, Miguel stood and took a deep breath. "I'm going back to see if there's anything I can do," he said, "and mom…thanks… ." "What did I say?" Raul asked, watching the swinging doors close behind his son. "Nothing, Raul. He's just worried. Remember how you were when our children were born. He's just like you. He always wants to be in charge of what's happening…but that isn't the way of the world…he gets quiet just like you do." Other than clearing his throat as though he was going to respond, Raul sat in silence, remembering the long wait when Miguel was born…the doctor's tight-lipped attitude…the agonizing hours until they gave him permission to see Delores and the baby. Sixteen hours. Stooped in the fields, I never worked sixteen hours without a break in my life. It showed in her face when I sat by her side, holding her hand, watching Miguel trying to nurse for the first time. Twenty minutes later, Pablo and Claudia appeared, breathless and glowing. "Has she had the baby?" Pablo asked, shedding a heavy leather coat. "Is everything okay?" "We haven't heard anything yet," Delores said, scooting toward her husband so Claudia could sit next to her. "How are the children?" "Just fine, mother," Claudia said, brushing long strand of wind-blown hair from her forehead. "It seems just like yesterday…Victor trying to climb his grandfather's leg. I can still hear him laughing, 'Horsy!' Papa could keep Victor in mid-air between bounces. I can't believe he's going to be nine." "Dear God," exclaimed Delores, hand flying to forehead, "has anyone called Teresa to let her know?" "I did." Her son nodded and kissed his mother's smooth forehead. "Don't beat yourself up, mother. We need you during times like these. Teresa said she couldn't leave right now. Mercy Hospital has scheduled eight surgeries. She said she'd call tonight around seven. She's very happy for Sandy and Miguel. She'll come up as soon as she can." Two hours later, the door opened. Miguel appeared all smiles. "It's a boy! Leo! A son!" He stood there grinning, a white gauze mask around his neck. "I'm a father! Sandy is doing fine! The doctor said we can go in and visit her in a half hour, but only two at a time." "You're okay, kid," his brother grinned, slapping him on the shoulder, Congratulations! Seven years…I was beginning to wonder… . Throwing a half-hearted punch, Miguel couldn't do anything but smile. "Raul…" cautioned Delores, giving Miguel a kiss on the cheek, "let the children decide for themselves. I'm very happy for you, Miguel. I know you'll make a perfect father." With the exception of Miguel, who stayed the night at the hospital, the family was back at their parent's home two hours later. After Delores fed them, the children cleaned the kitchen while she and Raul spent time with their three grand-children in the small living room. When the kids finally tired of telling school stories and fell into quieter games on the floor, Delores turned to Raul. "Are you going to church in the morning?" She was holding her husband's well-calloused hand. "You can use my car," Claudia said. “I'm not doing anything special. We don't need two cars tomorrow. I'll leave mine here tonight and you can bring it over tomorrow after you get back from church." "Thank you, Claudia." Delores gave Raul a sideways glance. "We need a newer car. One of these days that red truck is going to quit." "It's not that old," Raul defended, habitually running fingers through still-thick but graying hair. "A little work and it will run like new. They don't make them like they used to." Claudia didn't miss the expression on her mother-in-law's face. The two smiled tenderly into each other's eyes. Television was reporting a warm dry Christmas morning as the Hernandez family woke to a Santa Ana wind blowing away what had come to be a constant thick yellow haze hanging over Salinas valley. Pablo and Claudia had driven up from Carmel to fix breakfast for Delores and Raul. Twenty-five year old Ernesto, who was camping with friends, had promised to be back for Christmas breakfast by nine, a feast crafted by Claudia and Maria Louise. Miguel and Sandy brought ten-year old Leo over Christmas Eve to spend the night with his grandparents. Now—in the living room—nineteen year old Victor was using a time-tested ploy to keep his young cousin from getting into gifts, diverting Leo's attention by helping him set up an aging train track around the tree. "Remember…it goes like this. Put the track with the pins into the ones without… ." "When's Ernesto gonna get here?" Leo asked, eyes on the generous pile of brightly-wrapped boxes, a fortress of red, green and gold at the base of the tinseled, over-adorned conifer. "He'll be here soon." Victor plugged the black transformer into an outlet. "Come over here and run the train. I'll put the tunnel over the straight line on this side. Don't make it go too fast…it runs off the track." "Where's Auntie Teresa?" Leo’s attention was divided between tempting aromas of breakfast and beckoning glitter concealing surprises in an avalanche of gifts. Only imagination supported the illusion of snow, a white bed-sheet around the base of the tree. Leo's face reflected his interests. "Can we open a couple before everyone gets here?" "Here…run the train," Victor said. He adjusted the Lionel's wheels on the track. Temporarily abandoning his campaign on the booty, Leo sat beside his favorite cousin and turned the controls. Lunging forward, the locomotive leaned precariously to the right before crashing into a chair-leg, seven cars and a caboose derailing in its noisy wake. "Not so much power," Victor scolded, righting the crash, hooking cars back together. "Turn it easy, Leo, or the train will go off the track." "I know." Leo frowned and got up on his knees. "I can do it." He pushed the button next to the transformer. A raspy mechanical whistle sound came from the engine as he sent the train on its second attempt around the tree. "See," he said, glowing self-righteously, "I can do it." "Come to breakfast," Maria Louise called from the kitchen. "Everything's ready. Come on while it's warm." "But where's Ernesto?" Leo moaned. "Where's Auntie Teresa?" "Here I am." His aunt appeared from the bedroom hall, wrapped in a red terry-cloth robe. "I got in late last night, sweetie. Santa Claus needed some help with broken bodies. Let's get to the kitchen before our breakfast gets cold." Obviously tired and drawn, Teresa offered Leo her hand as they joined the small crowd of smiling relatives around the big kitchen table. "Where's grandpa and grandma? Aren't they gonna eat with us?" "Sit down, son," Miguel said, roughing Leo's hair while pulling out a chair for Sandy. "We're going to eat together. They're getting up now." While Maria Louise brought steaming dishes to the table, Pablo seated Claudia. "Would you be a gem and pour some coffee?" he asked, watching his grown daughter with unconcealed fatherly pride. "I'll take some juice," Leo piped, holding out his glass. "Be patient, Leo," Sandy said. "Wait your turn. Auntie Maria only has two hands. The sound of Raul's gravely voice coming from the hall sounded more like a bear in a cave. Love in her eyes, arm in arm with her husband, Delores steered him to his seat at the head of the table. "Is everyone here?" he asked, smiling, new gold tooth framed by ivory, hair almost as white. "Ah, Leo…have you been a good boy this year? Remember…Santa knows!" "I've been real good, grandpa. Really! Ask my mom!" "He's been a treasure," Sandy said, smiling a proud mother smile. "Now let's all eat so we can go open the presents. Santa must think we don't care about his gifts." "They're not all from Santa," Leo said. "You and daddy put presents there for us too. I saw them in the car last night." The family fell into eating and talking animatedly as soon as Pablo finished saying Grace. Sitting close to her husband, Delores cut his tamales and rolled steaming frijoles and arroz in a warm tortilla while he sipped coffee. After sweets and more Mexican coffee, the everyone adjourned to the living room where Teresa took on the task of handing out presents. Within an hour the place was strewn with colorful paper. One by one, family gifts and an assortment of toys for Leo soon piled higher around the fragrant pine than they'd been before packages were opened. "Look grandpa! Look at my new dump-truck!" Green eyes sparkling with childish excitement, Leo held a red truck aloft. "Can I go outside and play?" "Absolutely. Come with me, Leo. We can take a load of dirt out to grandma's garden." "I'll tag along if it's okay," Teresa said, slipping blind feet, years without sun, back into soft bedroom slippers. "Give me a few minutes and I'll pull on some jeans." Five minutes later, Leo was excavating the driveway while his grandfather sat on the steps in morning sun. Joining him, Teresa sat, cup of coffee in hand. "Nice Christmas, Papa." She smiled and slipped her arm between his and his ribs. "No smog. How are you feeling? Let me see your eye." Turning his head reluctantly, Raul let his daughter examine him. "No," he said, shaking his head. "I'm fine, Teresa. No pain. The doctor said I'd be able to see a little better, but I have to wait for my new glasses. He said I shouldn't try to drive any more." "Papa, you shouldn't. You don't have a license. Don't be foolish and try to drive a car. Pablo or Miguel can always take you wherever you need to go. If they're busy, the Santos kids can run errands for you and mother." "I don't like to be dependent on others." Raul took a deep breath and left a long sigh hanging in the air. "This will take me some time to get used to." "Papa," his daughter said, arm around his widening waist, "we all need each other…we all depend on each other. That's how you raised us. You taught us the right things. Listen to what we learned. We learned it from you, papa." Eight piles of earth next to him, Leo wasn't interested in adult conversation. Dozing up a new pile, he scooped sandy soil into the new red dump truck with an earthmover toy, a gift from the year before. "Want some more coffee?" Teresa stood, stretched, and yawned. "I'm bushed." "Thank you," her father nodded, watching the boy. As she went in, Victor came out onto the porch and took Teresa's seat next to his grandfather. Bird-song filled the silence between engine noises generated by Leo as he moved earth from the front to back yard. Sweet as Delores's postres, welcome stillness in morning air filled Raul's tired lungs. Eyes closed, prism lights on lids, he listened to Salinas Christmas morning, the past rushing in on him like traffic on the new freeway…sounds of his children in the little home behind him, grand-children laughing, his heart so full of joy he couldn't speak. "What are you going to do with it, Grandpa?" Victor asked, breaking the ethereal magic. Opening his eyes, Raul tried to focus on his grandson's face. "Do with what?" he asked, smiling benevolently. "That old truck," Victor continued, gesturing with a nod toward the faded red chassis at the end of the tall overgrown grass drive. On blocks for the past seven years, the vehicle sat out the seasons in the yard. One window broken, tires gone, flowers grew in the bed when seeds germinated in the warmth of each spring. “What?" His grandfather put his arm around the growing boy's shoulder. "Well, I was wondering if…well, if maybe I could have the truck, Grandpa, Dad said he'd help me fix it up. It would look so good…new paint. I could put a new engine in it…and hydraulic brakes too…new upholstery. Golly, Grandpa, it would be so neat. It's such a great pickup. No one would have one like me. I'd have the hottest rod on the street. Really." Years slipped away like leaves in fall wind as Raul’s attention shifted to the red truck. Appearing new, it sat, bright red once again, family name on the doors. Then, like his vision, fading…sounds of the old V-8 engine, mechanical brakes complaining when he stepped hard on the pedal, truck slow to stop…the smell of twenty-cent gasoline when he filled the tank. Standing stiffly, he descended the four big steps, crossed the gravel driveway, walked toward the garage, and out of breath, arrived at the truck. The short journey took nearly a minute. Hand on the sun-warmed fender, he waited for his heart to stop racing. Maybe my eyes are bad, but I can still see that hole where the bullet went through the door six years ago. I guess some fool thought it was a target after I put the truck up on these blocks. Leaning through the open window, he squinted hard, surveying the interior, surroundings so familiar he felt he could draw them without ever seeing clearly again. There's that cracked glass over the speedometer. That was an accident. I should have been more careful with the end of that shovel. He examined the sagging seat—the covers torn and faded, stained by time—that carried him like some magic blanket through inland valleys of California. The steering-wheel horn is still missing. He caught the smell of a bed-full of fresh produce from fertile soils, the earthy aroma of artichokes and tomatoes. Then the memory of that hot Salinas Sunday in 1934 embraced him: Delores's worries; the tasty breakfast he ate before walking into town. He heard their kitchen conversation, his wordy explanation and her resignation. He saw the skinny truck-salesman, remembered every tick on that hardware store clock…remembered his hopes and dreams. They've all come real. The business; Delores's garden; the children; their grandchildren. Unable to speak, tears overflowed dark eyes and his once strong legs felt suddenly weak. "Are you okay, Grandpa?" Victor asked, moving to his side to support the old man. "I'm sorry, Grandpa. Mom said we shouldn't let you exert yourself too much. Come on back and sit on the porch. I'll help…lean on me…it's okay. Don't worry, I'm real strong, Grandpa." Arm around his grandson, Raul turned slowly and the two made their way back to the porch. Appearing with coffee, Teresa set it down and hurried to her father. "Don't make a big fuss," Raul said, catching his breath, holding up his hand. "I'm all right…really." Victor and Teresa exchanged concerned glances, but Raul just waved them back as he sat. No one spoke for minutes. "So," he said, taking a deep breath, "you need a truck? That one will take a lot of work to fix up. It was a good truck, Victor. I wish I could tell you about every trip we took, that truck and me…it was my first truck." Instantly realizing the meaning of her father's remarks, Teresa probed Victor's face like a surgeon looking for a bullet in a wound, Looking down, Victor said nothing, chagrined that he'd tired his grandpa past good judgment. "Don't worry your grandpa about cars," Teresa scolded, fingers on her father's wide wrist. "No…" Raul said, holding up his hand in protest, "he's no worry." Smiling fondly, he put his arm around his grandson. "If your father agrees; and if you think you can make her work again, she's all yours, Victor. If you need any help…whatever you need…you just ask me. There's nothing I wouldn't do for you." "Oh, Grandpa!" Victor said, so happy he couldn't contain his excitement. "Can I go tell dad? Gee, I'm gonna have the neatest one at school!" Fleet to feet, he gave his grandpa a quick kiss on the head, turned and went through the front door almost as fast as that bullet had gone through the old truck. Teresa and Raul could hear his enthusiastic voice as he told the family the news. "Daddy… ." Teresa said, taking her father's hand, dark eyes filling with tears. "Well, it's about time," he said. With his daughter's help, Raul got to his feet, appreciating his true family fortunes. "It's a good truck," he said, and nodded emphatically, glancing back at the old chassis up on blocks. "Everyone said so. Best ones made."